We are pleased to offer members the opportunity to promote your business or highlight a new product via banner advertisements on our newly re-designed website. Banners are placed under the “Site Advertisers” section of our home page and are subject to a random rotation, allowing web visitors to see a variety of ads at any given time. Advertising rates are based on a minimum commitment of 3 months with discounts applied to extended runs. Please complete the online form below. If you prefer to mail or email your order form, click the image at right to download the hardcopy order form, complete and return it with your banner image to the attention of Alie Griffin via e-mail at publications@southeastdesalting.com or to our mailing address. 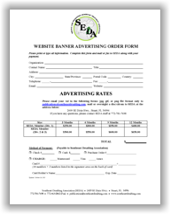 Please note that SEDA has the right to refuse acceptance of the banner ad order requested. Banner ad pricing depends on Member Type and prices will be displayed after you select your membership type. For membersip information please select the following links, membership levels and/or membership application.